Windows at the Purecontent Media office in the council building at North Lodge Park are bedecked with lace curtains. Fortunately this is a temporary measure while the building is used as a location for a TV film. 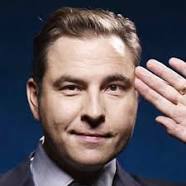 The popular actor David Walliams (Little Britain, Come Fly With Me, Capturing Mary) is playing the lead part in a BBC production of an Agatha Christie story set in the 1950s. The area around The Lodge has been dressed to echo the period, with the roadway being covered with loose chippings and fake lamp posts lining the main drive. Cars and a motorbike from the period have also been on the set. Shouts of “rolling” and “cut!” have echoed around the site as the filming went on. A small crowd of cooperative locals watching events have kept quiet as and when required. Mr Walliams has been obliging with autographs and allowing himself to be photographed with fans. He is said to be impressed with Cromer, particularly our lovely pier. Has all this activity affected the work in our office? I must admit that the lace curtains have been tweaked at times, particularly by our general manager, Jo, who is a real David Walliams fan.